Plus Size Spring Dresses always make you feel special and feminine - A new season and a new look from winter's darker layers. They are available early in the season in ample supply - show as early as you can for the most choices!). Maxi Dresses keep getting more popular every spring and summer. For Spring 2014 we're seeing a lot of asymmetrical hems. Most of them are "high-low" - short in the front and long in the back. They are either called high low or sharkbite hems (because they look like a shark took a bite out of them!) This season look for all white as a huge trend. Abstract and floral prints are also big, especially black and white prints. Add red, lime green or fuschia accessories (belt, purse or shoes) to give it a pop of color. All kind of stripes are big as well for spring dresses. I'm not seeing very many solid color dresses. No matter if you need one for Easter, for a spring wedding or other special occasion, or just to celebrate the season, here are this season's best Spring Dresses. Macy's selection of plus size dresses for spring tend to be upscale and trendy. They have a great selection including designer and name brands including Ralph Lauren, Calvin Klein, Baby Phat, Jones New York, Michael Kors, Evan Picone and Donna Ricco. Nordstrom has a beautiful selection of upscale and designer Plus Size Spring Dresses. If you need a very special Spring Dress, be sure to check out their selection. 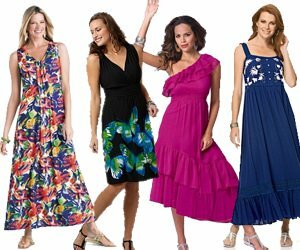 Avenue has an great selection of plus size spring dresses in sizes 14 to 32. Their dresses are moderately prices and the styles are trendy and up to date. Most of their clothing is more trendy and casual, with many that are also appropriate for business or church wear.